Fractures are common in car crashes. The force and power of the accidents snaps bones in half. Collisions and debris exert lots of trauma onto the skeleton. Our attorneys represent clients who break a bone in a auto accident. They often have very serious fractures. We know how expensive and painful they can be. The recovery process is exhaustive and costly. Even if it isn’t that taxing, it still might limit your ability to work or play. Plus, healing can take up to six months or more. We will discuss broken bones and car crashes in the sections below. Speed is a major factor in auto accidents. It contributes to the injury. Sudden deceleration or impact causes extensive harm even at low speeds. Our Chicago auto injury lawyers work with victims with broken bones. They might have other types of injuries too. Here are some ways you could break a bone in a car crash. You could get thrown from a motorcycle. The impact with the ground might cause a fracture. Motorcyclists may also break bones if they’re caught between two objects. It might be between a bike and the ground or other cars. A crushing impact with a commercial vehicle. Truck accidents can result in severe and catastrophic injuries. The sheer amount of a truck’s power can devastate smaller cars. It leaves occupants subject to lots of harm. Being thrown from a vehicle during a collision. Without a seatbelt, you may be thrown from the car. These come often with high-speed collisions or rollovers. In addition to fractures, you could suffer lacerations and internal organ trauma. Striking an object during an accident. Passengers commonly throw their hands in front of their faces in an accident. They’re trying to protect themselves. Yet, this results in broken fingers, hands, and wrists. Getting caught between objects also fractures and shatters bones. There are many different forms of fractures. Each injury requires specific treatment based on its type and location. All fractures are classified as either simple or compound. Then, a more specific classification can be provided. A simple fracture occurs beneath the skin. It does not result in any lacerations or protrusion of the bone from the flesh. Compound fractures occur when the bone exits the body at some point during the break. Before treatment is prescribed, you must identify the break type. Then, figure out the best methods to set it. Treatment will only come this way. Here are some of the most specific forms of fractures. Incomplete fractures. These are only partial breaks of the bone. The bone tissue is still held together by a portion of bone that has not pierced the skin. Linear fractures. These breaks occur down the length of a bone rather than across. Transverse fractures. These run perpendicular to the length of the bone. Oblique fractures. These breaks cut diagonally across the bone. Spiral fractures. These are caused by the twisting of a bone rather than blunt force. It can be especially painful and difficult to treat. Comminuted fractures. Often through shattering, these multiple breaks in the same bone. Impacted fractures. These occur when one bone is forced into another. It leads to a fracture and possible dislocation. Broken bones rarely pose any immediate danger to a victim’s life, but they can keep the victim sidelined for a significant period as he or she heals. Some fractures are far more difficult or painful to treat and may cause considerable pain and suffering throughout the recovery process. This is why it is important for you to pursue all avenues available to recover the financial compensation you need and deserve following a car, truck or motorcycle accident. You are entitled to recover damages for the cost of your immediate medical treatment as well as long-term care and surgical procedures. You can also recover recompense for the value of your lost wages, out of pocket expenses and pain and suffering. The ten most common broken bones are the: arm , collarbone, ankle , foot, toe, hand , finger, leg, nose and jaw . The most common reasons for broken bones include trauma (from car accidents , falls, sports, etc. ), overuse and Osteoporosis. Symptoms for broken bones include bruising, tenderness, deformities, pierced skin and swelling. Depending on how badly the bone is broken, the healing process can take anywhere from a few weeks to a few months. Without insurance, treatment for a broken bone without surgery can cost several thousand dollars and treatment with orthopedic surgery can cost tens of thousands of dollars. MEDICAL BILLS: You can collect for all medical costs associated with the accident including any surgeries, doctors visits, medications or rehabilitative care that you needed for your broken bones. LOST WAGES: If you could not work because of your broken bones, then you should fight for the lost wages that you suffered while recovering because the defendant owes them to you. SUFFERING: You can recover if your broken bones cause you long-term pain, emotional suffering, disability, disfigurement or other quality of life losses. Just because these injuries are intangible or invisible does not mean they are not real and does not mean defendants do not have to compensate you for them. PROPERTY DAMAGE: If the accident that broke one of your bones also damaged some of your property, then you can sue the defendant and recover for these losses as well. Typically, there are a few things you can do to predict what range of compensation your case might achieve. Of course, nothing is 100% certain because juries and the facts can be fickle but you can estimate. To start, lineup all your expenses and costs from the event that led to your fractured bones. Then, multiply that number by 2 or three depending upon how significant your intangible injuries were (think pain and suffering, scars, changes in your standard of living, etc.). This should provide you with a good guide to what litigation might be worth to you. Of course, you can really only know for sure until you have met and consulted with an experienced attorney but this is a good place to begin. 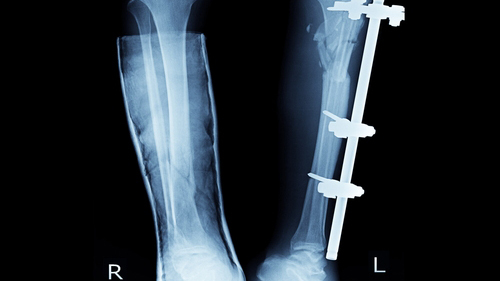 Rosenfeld Injury Lawyers LLC can help you translate your broken bone injuries into recovery. We will put all of our time and capacity to work to make sure you get the most compensation possible under Illinois law. Wondering how much that might be? Then give us a call and someone from the Rosenfeld Injury Lawyers LLC will walk you through what might be possible. Where the fracture occurred on the bone. Your age and health prior to the car accident. The nature of the fracture including break angle and damage to the local area of the body such as a tear in the skin. No matter how you fracture your bone in an Illinois auto collision, the aim will be to set up a treatment whereby the bone can come together and heal itself. To accomplish that, doctors will set the bone and then most likely place a cast around the affected area to ensure it forms properly. If the bone is not or cannot come together on its own, then the doctor may elect to perform surgery to replace part of the bone or guide its union in a process called fixation. What options are available to you depend on your health and the circumstances of your fracture. As you can tell, the medical treatments required to fix a fracture following a car crash can range from very simple to very complicated. The latter can cost you and your family a lot of money. This fact should be taken into consideration when filing your claim in Illinois court and seeking damages. These expenses are absolutely recoverable in court and should be carefully itemized as you build your case. Our team of experienced attorneys can ensure that you don’t miss out on one dollar of compensation that you deserve under Illinois law. Fractured bones are one of the most common and serious injuries that arise out of car accidents in Illinois. Therefore, victims experience all kinds of damages and changes in life because of the incident. However, that doesn’t mean that defendants rollover in court. Here are just a couple of the comebacks they normally use in Illinois lawsuits. Contributory Negligence. Defendants in car crash cases often point the finger at the plaintiff. They conjure up arguments that attempt to show how the victim caused the accident or at least assumed the risk of injury. Generally, the best way to defeat this tactic is to use the facts and circumstances of the incident to disprove the theory. However, even if the plaintiff was contributory in some sense, it should not void the claim entirely unless it was more than fifty percent responsible for the collision. Excessive Damages. Even if you are able to show that the defendant caused your damages, it will still likely return volley with the argument that your damages are not as much as you claim. Especially with intangible damages like reduced quality of life, defendants are commonly successfully in reducing the amount of compensation a plaintiff can recover for. Normally, these plaintiffs commit a number of errors that lower their recovery including the following: don’t preserve evidence quickly enough; don’t collect and itemize records and expenses; don’t use analogous case law to strengthen their claims for relief; and don’t forcefully push back against defendants’ theories of contributory negligence. Rosenfeld Injury Lawyers LLC provides award-winning legal services to clients. Many suffered debilitating injuries in automotive accidents. Our firm has access to all the resources you need to recover. You might have physical, emotional and financial losses. Our Chicago auto injury lawyers have years of experience. We have a track record of success. You can be sure we have the knowledge and skill to win. Contact us today to arrange a free consultation. Our team can collect all the info to build a case. We’ll work on your behalf to maximize your recovery. You might have questions. We can answer all of them. You’ll have several legal options at your disposal. Each of them should be reviewed in turn. That way you will know to best resolve your case. We work solely on contingency. This means you won’t owe us a thing unless we win for you. Give us a call today to get started. Learn about what you can get in court!